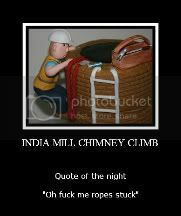 India Mill Chimney Climb, Darwen - June 2011. Last edited by SoLo1; 28-06-2011 at 15:28. Top draw this, often wondered what it was like at the top of here since seeing fred soloing it, there's no way you'd get me past that overhang safety or not!! Fantastic stuff guys. You wouldn't get me up there but I'm glad someone took the rare opportunity to do it.